The water cascades downward into a golden and gleaming dark abyss recalling the open gash left behind from a smoldering, smoky debris of a most monstrous treachery. The emptiness conveyed in these pools of grief, if left alone, would memorialize unrelenting despair, apart from any spirited and resolute determination to creatively respond. However, reflected beyond the shimmering glow pouring upon these lakes of repose and respect, a skyscraper has risen to keep watch over our best and brightest. 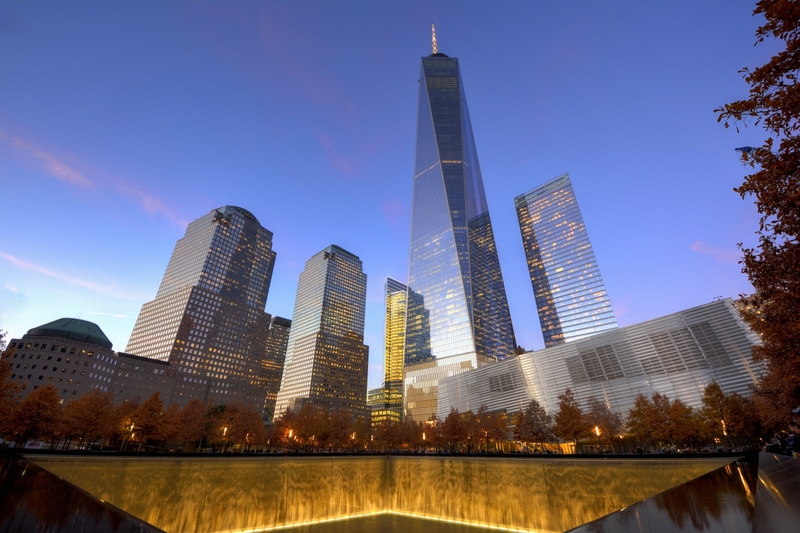 Called a Tower of Freedom, even more than the two gaping chasms fashioned in concrete, it is a living expression, declaring that our recollections remain, and that we will never, ever forget. Whether as victims, or in victory, Americans have shown that we know how to rebuild. At Pearl Harbor, and more informatively, in Japan and all across Europe, America has demonstrated the unique approach of uplifting those who attempted to bring us down. We have reconstructed factories, re-made steel mills and completely renewed harbor yards, turning mortal adversaries into competitive friends. The enemy we currently face is somewhat more intractable than the nationally uniformed combatants from a prior generation and paradigm. In deeply desiring peace, we could be faulted for being too naive about the cessation of this war. The relieved sentiment in the West left helpless the first victims of resurgent terror whose only liability was living in closer proximity to the religious blight now inflicting itself upon the whole planet. Yet, even a cursory glance at history shows that the denial of things far away eventually leads to facing a more potent foe here at home. The voracious evil we must strive against now is such that aid workers are as likely to be barbarically murdered as armed and trained soldiers. So, in this season, while it would be especially tempting to try thinking of happier things and dozing off into easier times, we must remember that the first Thanksgiving did not afford such an option. The one fast approaching will not either. Whether initially sought after or faithfully held onto, Freedom has never been easy. Those who have it don’t always appreciate it, and those who resent it are trying to erase it from the landscape of human experience. In the current materialistic malaise, some may wonder why our particular engagement matters, as they miss the blatant fact that has made such a positive difference in shaping the terrain of the modern world. We are Americans. Those who went before us did not intend for us to be like everyone else. Instead, they gave their lives to secure an idea for a people they yearned to bring to fruition, but had never actually seen in real life. They died to give us the lives that, even in conflict, offer us an incalculable abundance in opportunity, and thereby, an unprecedented imperative of responsibility. So we must hold a heartfelt gratitude amidst the exceptional challenges that face our country. We are the people of the United States, and if we would strive to be great, as our liberty demands, we must also be willing to bear the characteristic burden of leadership that falls uniquely on our shoulders. We know what it is to be knocked down. Yet we’ve also shown what it is to stand up as a tall beacon bringing light and liberty most brightly for those of our sisters and brothers who still see our common existence as an unreachable dream. With faith in God as the engine of our endeavor, our own historical desire has fashioned for us an extraordinary destiny that must include particular sacrifice. Yet, knowing our tables of plenty are set to nourish the calling we are privileged to fulfill, we once again lay claim to the legacy our forebears personally bestowed. That’s why this November 27th, we will humbly gather in appreciation of who and Whose we are, and give thanks. however, catching herself in mid-sentence, mom’s confessional admissions immediately ceased, being replaced with more predictably standard fare. Soon after, calls for more sweet potatoes coalesced with queries about who wanted the dark or white meat of the enormous turkey. Each of us is so incredibly blessed to live where we do, when we do and how we do. Some have more, others have less. But everyone we know experiences abundance and scarcity within wider circumstances that so many millions of others would never be able to dream about, let alone encounter. Quite apart from the material magnifying glass, the scriptures simply point out that we have all missed the mark. Thus we are invited to embrace the fact that stands beyond all others in its affect upon the world. We have all fallen short, yes. And, we are all forgiven. Not because of personal works, this is the pre-eminent gift of God. To be sure, starting in recognition of sin on Thanksgiving is not the most common approach in any dining room. Yet, this mindset leads to cherishing the brightest assurance touching every human soul alive on the planet. However great or grossly inadequate, the conditions in which we live are not reflective of the Divine love in which we are, and will be held. You are currently browsing the BillKeane Perceptions blog archives for November, 2014.